Being a birthday week and after getting the VISA crisis resolved last week so we could get money, thanks to a lot of help from Steve talking to Zions bank in Blanding who was on the phone to VISA headquarters in who-knows-where, the missionary apartment rented and the missionaries moved in, we were determined not to allow any more crisis this week. That lasted until about 10:00 on Monday morning when we received a call that the mission check we had written to rent the apartment had been rejected by the bank. I knew that would be no small problem as the smallest things in Benin seems to create the largest problems. 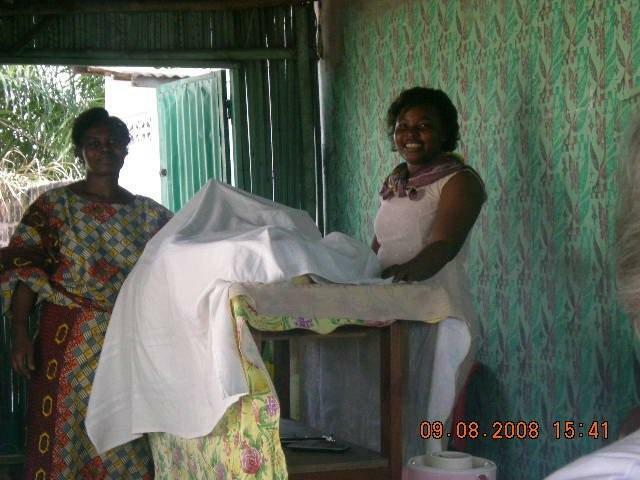 We hurried over to the agency we had given the check to, picked up Eve, the proprietor and headed to the bank to see if we could resolve the problem. She had been told the that rejected check was at Ecobank. After a number of lines and inquiries, we discovered it was really at her bank, Diamond Bank. By now it was raining as only it can in the Tropics but we went over and finally recovered the check. Back at our Ecobank, standing in some lines and waiting the appropriate amount of time, they finally admitted that they had made a mistake. We told them we knew that but what were they going to do. They had me write another check and cashed it on the spot, which is probably what we should have done to begin with. The whole process only took about 4 hours. We did have a chance while waiting, however, to teach the gospel a little to Eve. She is a sharp girl who has an MBA from a university in India. We hope she will be at church on Sunday. Home evening this week was at the Dike family. They all joined the Church about a year ago and are a really good family. Mama Victoria has a large family of mostly grown children. Only two daughters live at home now, Precious and Bertha. Bertha is a young single adult. Precious has three children, Victor, Faveur and Destiny. Victor and Faveur have all the articles of faith memorized. 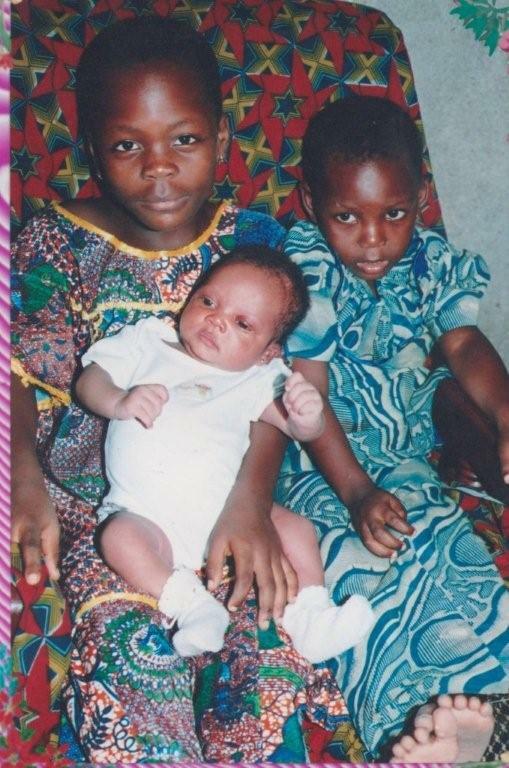 The children’s father was killed in a robbery in Nigeria. Soeur Precious is one of those people that visits everyone and is always busy. I think she is a good example of the scripture that you should “do many things of your own free will and choice and bring to pass much righteousness.” In spite of a lot of adversity in her life, she does exactly that. She is really looking forward to going to the temple in November. They are a good family, and we had a good time with them. 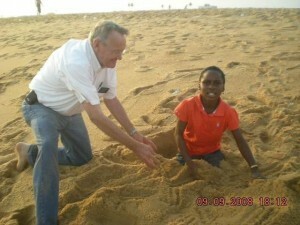 In Cotonou we never know when or where our hearts are going to be touched. This afternoon after Sacrament meeting we stopped by Shella’s house to see her and her daughters. She is the mother of the three little girls who share the one armless and legless doll. Shella had ordered a Bible, Cantique, and Triple combination so we decided to deliver them to her. Her youngest girl has some definite problems and has shown major behavioral disorders. We have gradually made progress with her as the first time we saw her all she did was scream and cry then several weeks later she called me a Yovo and sat on my lap at church. That was the first time we heard her talk to anyone. Today she actually smiled and sang “I Am a Child of God” for us. She had to hide her face behind her mother but the song was loud and clear with good pitch. The girls wanted to give us something, and we could hear them rustling around in the other room. 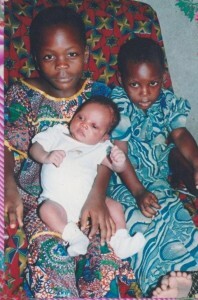 They soon came out with pictures of themselves when they were younger. I am sure these were the only pictures they have of themselves but they still wanted us to have them. As we left I could feel a little tear forming as I thought of their unselfishness with the little they have. This came after we had been asked by someone to help with a child’s schooling and another for taxi fare for a relative so they could come to church. The need for help is so great that we cannot even begin to help everyone we meet who “needs a little help.” Shella has never asked for help even though we are sure she could definitely use it. 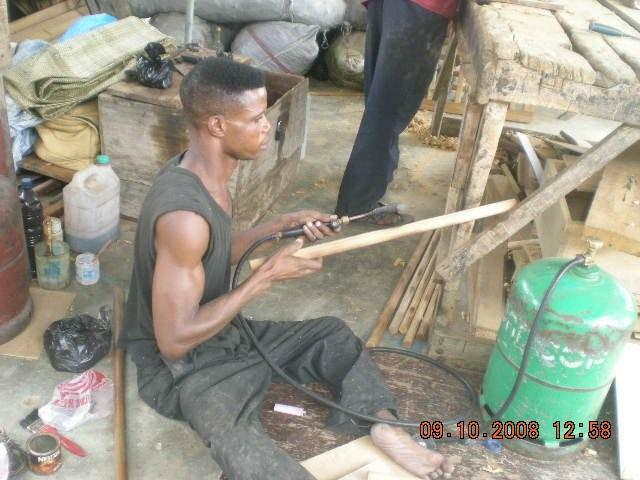 There are a few in the Branch that have decent jobs and make a good living for Africa but most struggle along with the great majority of the population of Benin. Even learning to share is part of the gospel. We are not commanded to live the united order but we are commanded to share. For us, that sometimes becomes a problem when the line between help and dependency is so thin. For the branch members, it is just humbling to see those who we know do not have enough food on their own table pay fast offerings to help someone else. Before coming to Africa, whenever I saw a person from the Negroid race, I could only see the color of their skin. When we first arrived I thought everyone looked alike but now I don’t even notice their color but can only see their personality, their spirit, the look in their eyes, the song in their voice and love in their hearts. The list could go on and on but I think what I am trying to say is that now I only see individuals whom I have grown to love. An older white lady is sometimes an attraction, and quite often little kids come running and want to hold my hand or give a hug. They like to see their little black hand in a big spotted white hand. I will admit that there is indeed quite a contrast! I often wonder what will happen to these children in the future as the opportunities are so limited here. I want to relate a success story of what can happen when a child is given opportunity. Last week or before, we mentioned a little girl by the name of Lillian, the Relief Society president’s daughter, who just started playing the piano keyboard. She has progressed very quickly and accompanied two songs today in sacrament meeting out of the easy hymn book. 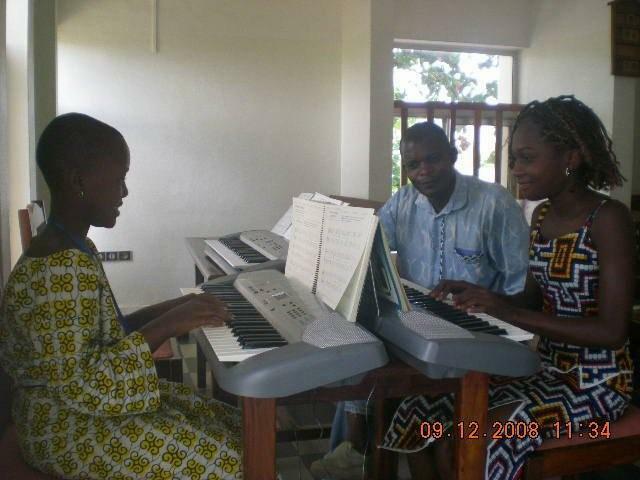 Frere Landu, the piano instructor, said she has progressed faster than any other student he has. 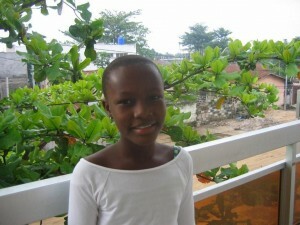 She is only 10 years old, very bright and has a sweet personality. It is a prime example of how a child can progress when given the opportunity. Her mother said that Lillian is very self motivated and uses her spare time to read and play the piano. The last crisis for the week is that the camera seems to have quit us so we did not get many pictures for the week. Fortunately we have a backup so we will try to do a better job next week. We know that pictures are more interesting than words. Monday, September 15, began as any other P-day with a shopping run to the marche and supermarket. The elders are given their soutien, or living allowance, twice a month and after each soutien day we make our run for groceries. There a few things like hamburger and cold cereal that are impossible to buy at the little stands along each and every road in Cotonou. They are very conscientious about making their soutein go as far as they can stretch it. But it is fun to see that they also reward themselves with a little bag of candy, yogurt, or if they are feeling real flush it could even be a soda pop. 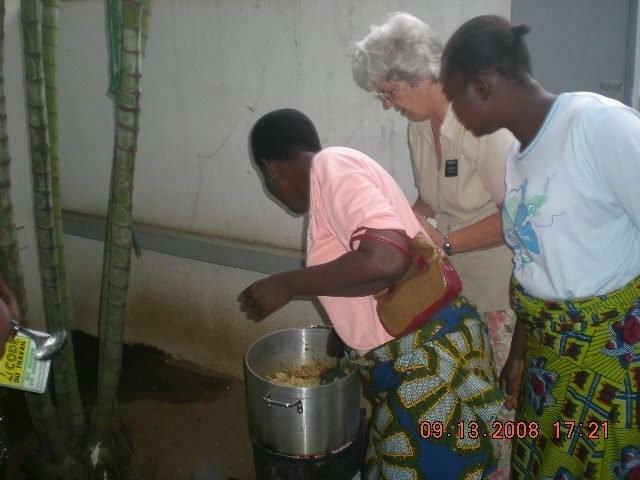 It was Elder Adou and Schweiger’s turn to plan the menu and help cook on Monday. They chose roasted chicken and French fries. I was not too thrilled with the idea of cooking that many fries in the kitchen and since we still had Josephine’s charcoal cooker in the truck from our Dutch oven experience last week, we decided to use it and cook the fries outside on the balcony. So far so good! We told the cooks to remove their ties since we were not going out on the street and it was hot cooking. We didn’t have to tell them twice that was a good idea. After cooking a mound of French fries, the two cooks came in and we all began eating. Yum, Yum! It wasn’t long until the doorbell rang and it was our neighbor saying something about fumer in our house. So far so good turned into, “Not good at all!” Boy, did that ever get everyone excited and we knew without even looking it was the charcoal cooker. 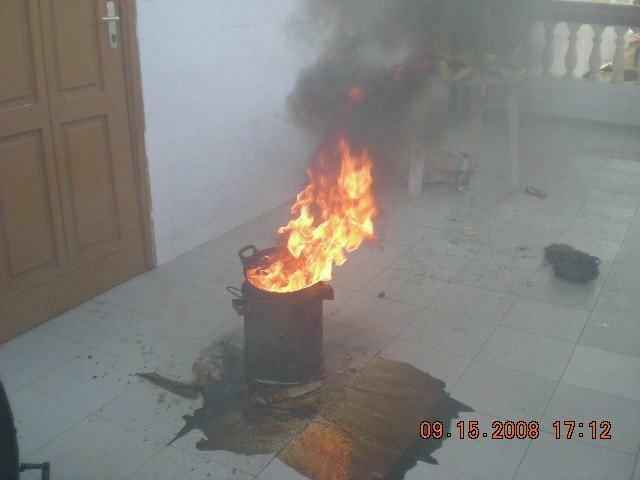 The cooks left the oil on the cooker so they could cook more fries if they wanted and forgot about it. We not only had smoke but a nice little fire to go with it. Elder Black grabbed the garbage can and turned it upside down on the fire and eventually the fire was out and all we had left was one gooey, black mess. Oh well, the fries were good and there was no permanent damage! It is pretty hard to burn down a cement house. The really big news was that we ate our first garden tomato with the dinner on Monday. Before they left, Elder Southam planted a tomato plant out on the patio, and the first tomato was ready on Monday. Actually it fell off the plant a few days ago but Soeur Black salvaged it and let it ripen in the kitchen. It wasn’t much but it was the biggest tomato we have seen in Benin and the bite I tasted was really good. We have a few others coming as well as another plant or two Soeur Black planted from seeds sent by Jody. On Tuesday evening we were invited over to Frere Eric and Soeur Estella’s home for another home evening with a couple of investigators, Elders Crooks and Foucher, and three members. Frere Eric gave a lesson on faith and had each person tell how faith has been an instrument in their life. He had Elder Black speak for both of us so it reinforced in mind the necessity to learn French a little better so I can communicate my feelings. 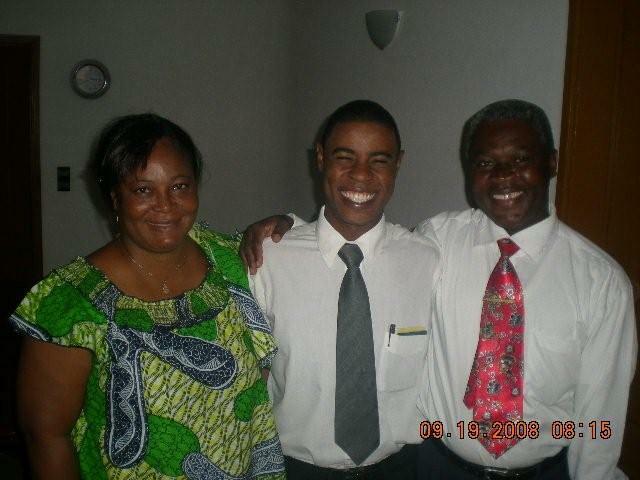 Eric and Estelle are stalwarts of the branch and have many talents to help the church grow here in Cotonou. He is the current branch mission leader and does an excellent job. Before he joined the church, he was a rosta which is a local name for a filthy, drug shooting guy with dread locks. 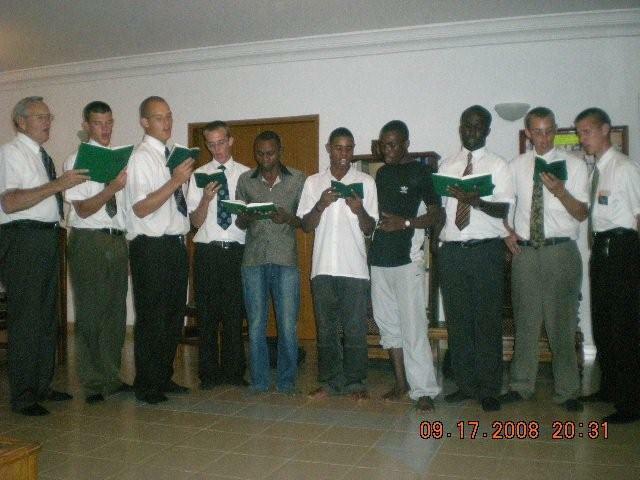 Now he teaches lessons, does missionary work, takes piano lessons and is always there when something needs to be done. Estella has a beautiful voice and leads the music in every meeting she attends. She too is always helping with whatever needs to be done. They are a classic example of a couple trying to blend traditional culture with the culture of the government and of the church. It goes back to the dote we described in a previous blog. He paid her family the necessary items to be able to marry her and they are now husband and wife. But Benin made a law two years ago that all couples needed to be married civilly. Since we believe in observing the law of the land, members of the church are encouraged to be married civilly and prospective members cannot be baptized without a legal marriage. Eric and Estella will have a civil marriage in two weeks and then be sealed in the Ghana Temple in December. Back to the home evening. After the lesson, Estella served everyone a delicious meal of fried enaies or yams, eggs cooked with onion, tomatoes and piment followed by fresh pineapple. We had besap to drink. After we ate they had a fun game ready to play. Each person was given a little box of matches, two circles were formed and then we had to start putting matches across the top of a pop bottle. It sounds easy but as we progressed around our circle the balancing act became more difficult. When your match fell, you were out. It was a simple little game but lots of fun. There is an idea for your next home evening. The major event of the week was sending Frere Elvis to the MTC in Tema, Ghana prior to him leaving for Cote d’Ivoire on his mission. He joined the church in July of last year and has a strong testimony of the gospel coupled with knowledge and commitment. He is another stalwart of the branch. 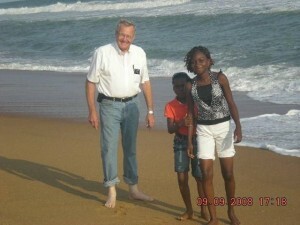 He taught Primary, was a branch missionary, took piano lessons and generally helped where needed like Eric and Estella. He has progressed so well on the piano that he has accompanied several hymns in sacrament meeting. With these qualities comes the biggest and most contagious grin you have ever seen. 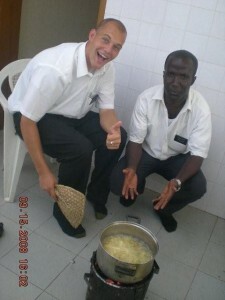 He relates so well to people both young and old which will be a great asset for him on his mission. On Wednesday evening we invited all of the branch missionaries, the music students, and branch leaders over here for a little farewell social for him. It was lots of fun to see everyone enjoying each other’s company so much. Then on Thursday, Frere Dieudonne, the counselor to President Ayekoue, came over from Togo to set him apart, which we did in his home on Thursday night and Elder Elvis got on his way Friday morning. The contract on the new missionary apartment in Menontin was finalized this week so we spent Friday and Saturday cleaning and moving the elders, Elder Crooks and Foucher. They are basically camping until we can get them better situated with a stove that has gas, a few pans to cook with, some dishes and utensils, etc. Most of Monday will be spent finalizing the moving process. Change can be stimulating and they are excited about opening up a new area for missionary work. It can be stimulating but also at the same time will take lots of concentrated, dedicated, old-fashioned work. Finding apartments and meeting houses is a real chore, but we keep working at it and things are developing slowly. The new crisis for the week is money. We have been trying all week to get money with our VISA card from our usual cash machines that have worked so well thus far. All of a sudden they won’t accept our cards. 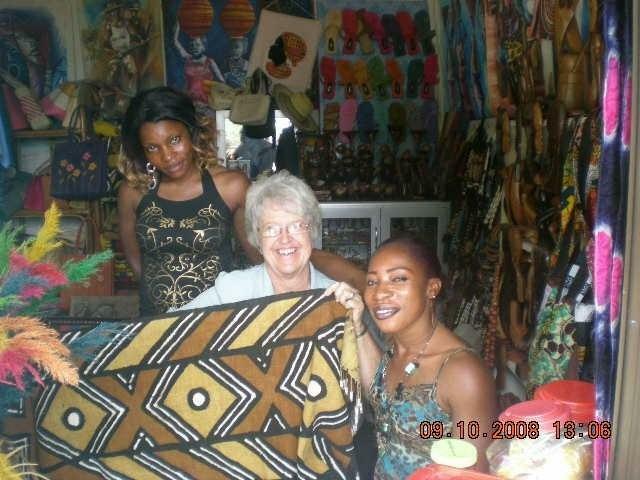 We are being told that it is a problem with VISA in all of Benin or maybe all of Africa. We asked when they expected to have them fixed and they said they didn’t know but is should be soon. Soon can have a lot of meanings in Africa but we will hope for the best and might have to borrow from the mission fund in the meantime. We went over to Frere Geoffroy’s for a family home evening on Monday. Frere Geoffroy is in every sense of the word a returned missionary and is keeping the elders in that area pretty busy just with referrals. His brother (actually half brother) Floren was baptized a couple of weeks ago. Floren is a student at the university and is a very intelligent up and coming young man. Also their Father was there from Bohricon, a town a couple of hours drive away. He has changed from being quite bitter against the Church to having a lot of respect for the Church as he has watched what has happened to his sons but he is probably not a candidate for baptism. A big problem there is that he has at least three wives that we know of. Frere Geoffroy gave a really good lesson, and Soeur Black made some good treats so we had a really good evening. 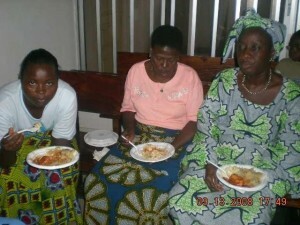 Cotonou has many sad, sad people in destitute circumstances, many because of physical handicaps. Consequently, there are beggars on every major road intersection and many times in between. Many suffer from physical deformities, most of which could have been helped with early medical attention or even prevented with proper vaccinations. It always tugs at my heart strings to see some of the suffering here but at the same time we see some real every-day heroism. At Leader Price, one of the super marches in Cotonou where we go grocery shopping, a young man without an arm sells phone cards. 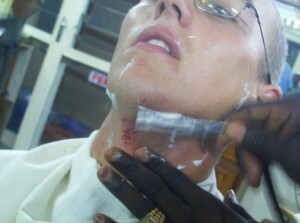 War is brutal here, and you see people that have had a limb chopped off, and he is one. When we go there we always buy phone cards from him as he is a clean-cut young man and seems to be doing well with his little business. He is not on the streets begging. Yesterday we bought an African bedspread from two gals who own a little boutique by our vegetable marche. It appears that one of the girls might have had polio, and her legs are shrunken and are in braces and she uses a walker. She is not on the street begging. Next to her boutique a man has a little business set up where he and two or three employees make bamboo furniture. One of his legs is badly deformed and mostly useless. We bought a little bamboo stand from him, and he made two poles and gave to us for us to hang an African tapestry on the wall. He is a very pleasant guy and not on the streets begging. These three people have our respect and our business. I always admire people with a positive mental attitude about their negative circumstances in life. In a previous blog, we talked about an investigator Louie and his family. Louie has never missed church since the missionaries started to teach him but his wife and two daughters are being a little more difficult. They are pretty happy in the church where they are for right now. Every time we go there we have quite a bit of fun with the girls. Our granddaughter Brielle has corresponded a little with Scholastic (nicknamed Seco) and she is also taking piano lessons. The younger girl Deborah has been preoccupied lately with going to the beach. Since we have not paid as much attention to her, we decided we would set a time and take them. We were hoping it would be a family activity but Louie said they weren’t that interested – just take the girls, so on Tuesday evening we picked up Deborah and Seco and headed for the beach. 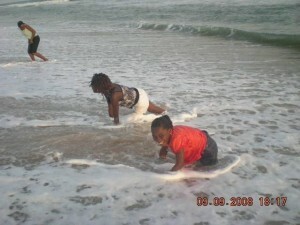 The beach is probably about 3 or 4 miles from their home and this is only the second time they have been there. Most people don’t have cars, and transportation is generally by foot or taxi. It also seems as if families do not have many fun activities together. Most of their time and energy is spent simply living and surviving from day to day. People at the beach tend to stake out a little area where you can park and they charge you a few francs to “guard” your car for you. We tried to avoid such places but as soon as we pulled in a little guy came over and offered to let us park in his area so he could “guard” the pick-up for us while we played on the beach and had our picnic. We weren’t sure but what if we turned him down we would need a “guard” so we asked him how much. He stated that he wanted 500 cfs ($1.00) and when the girls heard this they were talking back and forth about that being too much. Then the next thing we knew, ten year old Deborah came right up out of her back seat, got in his face and told him in no uncertain terms that was way too much, it should only be 100cfs. He responded by saying that 100 cfs was for a moto not a vehicle. She wasn’t willing to back off so we finally decided we better protect the poor guy and intervened on his behalf offering him 200 cfa, which he seemed quite anxious to accept if we would call off Deborah. We were quite amused by the whole scenario and were surprised that little Deborah was so spunky! When we got over to the surf, Deborah was a little hesitant to get near the water and held my hand tightly but it didn’t take her long to get the spirit of playing on the beach. When it was time to leave, she wanted to stay longer just like kids at home. We almost had to drag her away. We had a really good time and came away determined to see if we can put together a branch young women’s activity to go back again. Soeur Black gets us in trouble once in a while by not speaking French fast enough. Tonight (Saturday) was one of those times. Either because she couldn’t speak fast enough or because she volunteered (although I can’t imagine that) we ended up in charge of a cowboy dinner and entertainment for a Relief Society Activity. Soeur Black rounded up a couple of charcoal cookers and some pans that we thought might serve as Dutch ovens. You really haven’t lived until you have tried to cook Dutch oven potatoes and chicken, without Dutch ovens, over a charcoal fire with about 15 women all speaking Fon at the top of their lungs interspersed with French telling you how to do the job. We were supposed to be the experts, but every time we turned around someone was trying to tell us we couldn’t do it that way or taking our tools away. First of all they won’t let you do anything. Every time you pick up a tool and try to do something they try to take it away and do it for you. We finally kind of got the point across that we were going to do the cooking and they were going to watch. They weren’t being mean. Just trying to be helpful. I don’t know if it is because we are white or older or just what but it seems like every time you try to do anything someone tries to stop you and do it for you. Sometimes it is for money but the sisters were just trying to help out. I got the chicken cooked in oil and started to dump out the oil so I could put in the barbecue sauce and that really raised a ruckus. We had to save the oil because that was something they could cook with later. Worse than that, they insisted on dumping the used oil in with the leftover marinade the raw chicken was soaked in. We hope whatever they made with it was good, but we don’t want to be invited to dinner. A Branch member loaned me his guitar and Soeur Black finally sent me inside to entertain while she finished the cooking. When we were ready to serve, I dished up what I thought was a pretty good plate of potatoes with a nice piece of chicken. The first sister frowned and said she wanted more potatoes so I loaded on about all those little plastic plates would hold and that continued until everyone was fed. Soeur Black and I barely got a little taste at the end. About 15 women went through close to 20 pounds of potatoes! Potatoes are quite a luxury over here and cost about 75 cents per pound so not many people eat them. Maybe that was why they were so popular. Anyway, it was a great activity and everyone had a really good time. We were thanked over and over for doing it. The taste that Soeur Black and I got reminded us of home and almost made us homesick. The past couple of weeks have been filled mostly with administrative tasks. Let’s face it, looking for apartments just doesn’t give rise to that many spiritual experiences. Nevertheless it needs to be done and we are working hard to try and identify where each member lives so that we can draw some division lines, find some suitable places to rent for chapel space and get the missionary apartments decentralized so that the missionaries will be able to contact more people and the church can grow faster here in Cotonou. It isn’t that the work is boring, it’s just that it doesn’t produce many experiences worth writing home about. The urgency is, as we have stated before, that the chapel just won’t hold any more people. Today there was standing room only and even standing room is getting in short supply. 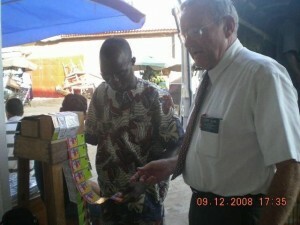 After the zone conference two weeks ago, President Ayekoue did shake up the missionaries a little. We didn’t have any transfers in or out of Cotonou but the companionships here in Cotonou were all shifted around, so now all the Elders have new companions and some are working in new areas. We are being told that we can expect more missionaries soon. 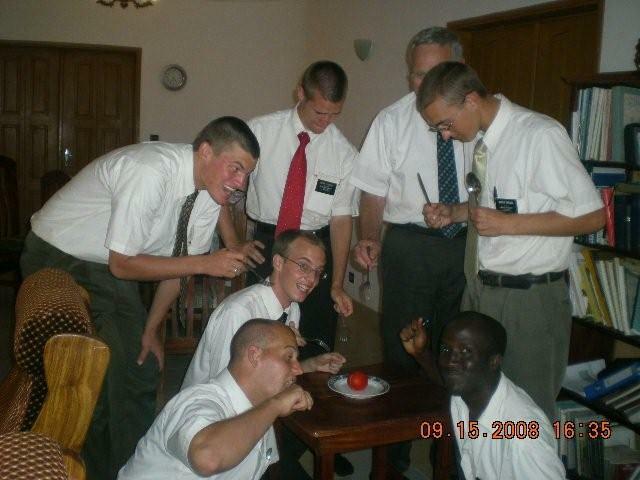 “Soon” can have various meanings in Africa but I think the plan is to double the missionary force in Cotonou so we hope to have 12 elders here. Associating with the elders is such a positive aspect of our missionary work. I think at times we keep each other a little entertained as we have many “senior moments,” and they have the enthusiasm of youth. For example, Elder Black quite frequently forgets a tie and then says,”I was wondering why I was so comfortable.” (He does get one on before we leave the house, however.) 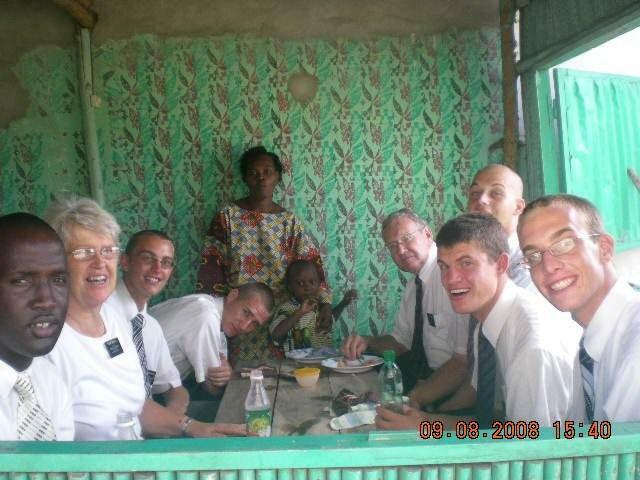 Many times I forget my missionary tag and then when we get to a rendezvous we have forgotten our cantiques or even our scriptures. They take it all in good stride with a good sense of humor. The elders cut their own or each other’s hair and most of the time they look like skin heads but in Africa you need to be practical. Keeping your hair parted would never work here. Elder Schwieger called last night and said he was cutting his hair and the spacer fell off the electric clippers so he shaved off a streak down the middle of his head right down to the skin. It was a Mohawk in reverse! A couple of weeks ago Elder Crooks decided that he would have Gilberto’s coiffure across the street give him a good shave. I guess the coiffure didn’t know what to do with a pale face with tender whiskers and he ended up with a slice out of his throat. He is the same elder who shaves half of his face one day and the other half the next day as elders are supposed to shave every day. Now that is obedience! Monday is preparation day for the missionaries and it is a day not only for preparation but also for building friendship between all of the missionaries. 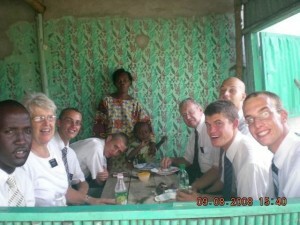 The elders have one hour of time on the Internet to send and receive letters from family and friends. They clean their apartments, especially when they know an inspection is coming from Soeur Black, wash their clothes, have a rousing game of foos ball, go to the marche to buy ties, and shop for food or other needed things. We eat together on Monday afternoon, and that is a time when the pressure is off except when their team is on cooking detail. We have a good time together even in the kitchen! The two sisters who cooked our zone conference meal are opening a little side walk cafe today and we are going there as a district to support them. Besides we know that they are excellent cooks! Three weeks ago a young couple, Brian and Lynne Larsen, from the United States showed up at church. They have been living in Iowa where Lynne is finishing a doctoral degree in African art and then they are in transition to the University of Washington in Seattle where Brian will get his doctoral degree in English and Irish literature. 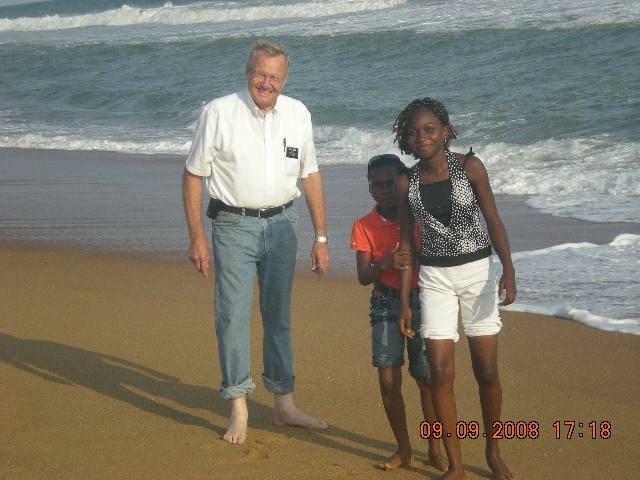 They both graduated from BYU and went on missions, he to Ivory Coast and she to Germany. He has been home for about ten years and has retained his French speaking capabilities very well. Lynn received a grant to come to Africa to study African art at the source which I believe can make one’s research more meaningful. Besides Cotonou, they visited Abomey, Ouida, and Porto Novo. They are adventuresome souls traveling around with just a backpack and using local moto taxies and staying in whatever hotels they can find when night comes. We invited them over to dinner last Sunday and they ended up staying the night with us. They left two little boys at home so they were anxious to get on their way home last Friday. They had to be at the airport at 4:30 in the morning, so we invited them back last Thursday night and took them to the airport early on Friday. Getting to the airport at that time of morning without a vehicle could be an experience in itself. Pierre had run across them when they showed up at the chapel and invited them to his home, so we went over to Pierre’s house on Thursday before they left, had a good visit and took some pictures. They left us with a good contact (one of their taxi drivers) who has already called us and wants to meet with us to learn about the Church. We enjoyed their visit and had plenty to talk about. 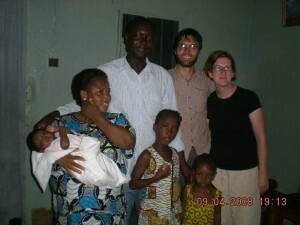 The Dansou family, Paul and Honorine and their two little boys (age about 3 and 6 months), are getting ready to go to the temple soon. There has been a temple preparation class going in Sunday School for a few weeks now, but Paul asked us to come over to his home and talk to them a little more. Soeur Honorine speaks only a little French and is mostly a Fon speaker so I think he wanted to have us come to his house where things were a little more quiet and he could translate better for her. They are a really fine family and their two little boys are cute as can be. Paul has a little welding shop in part of their home where he makes his living but work is slow right now. They have been members for a couple of years now (as have most of the members) and Paul is the financial clerk in the branch. Paul is learning English and doing quite well. He likes to speak to us in English and insists that Sister Black respond in French. We are going over again tonight and Soeur Black is going to help Soeur Honorine get started on a temple dress. We wish we could go with them to the temple but that probably will not happen. After that we are going over to the home of Frere Geoffery (our returned missionary) and his brother Floren (who was baptized last week) for a family home evening. Frere Geoffery is still keeping busy as a missionary and is almost keeping one team of missionaries busy with referrals.